On Wednesday, September 23, the Interfaith Center and Swarthmore’s International Club, i20, organized a panel and a candlelight vigil to spread awareness about the Global Refugee Crisis. At the beginning of the event, the student moderator, Joelle Hageboutros ’16, gave context about the current global refugee crisis. According to Hageboutros, the United Nation says that we are currently living in the midst of the worst migrant crisis since World War Two, a crisis in which almost a quarter of a million migrants are seeking asylum in Europe. Following Hageboutros’ introduction, the panel spoke about the crisis. The panel featured four speakers: Professor Sa’ed Atshan ’06, Reva Dhingra, Professor Shervin Malekzadeh, and Professor Erica Dobbs. The four speakers presented for fifteen minutes each and then answered questions from the audience. The first presentation was given by Atshan, Professor of Peace and Conflict Studies, and was titled “Origins of the Syrian Refugee Crisis.” In his presentation, Atshan gave a brief history of Syria, beginning in 1946 when Syria gained independence from France. Atshan’s presentation highlighted the losses, both economic and humanitarian, that Syria has encountered due to the ongoing crisis. According to Atshan, it is estimated that Syria has lost $202 billion dollars, three million jobs, 210,000 lives in the crisis. In addition, about fifty percent of the Syrian population has been displaced. Currently, the U.N. estimates that there are almost four million Syrian refugees, and 7.6 million displaced Syrians. Next, Dhingra, who has recently returned as a Fulbright Scholar from Jordan, gave a presentation titled, “Losing Syria’s Youth: The Education Crisis Facing Syrian Refugees in the Middle East.” In her presentation, Dhingra focused on the lack of access to education for young Syrian refugees in the Middle East. According to Dhingra, over 2.8 million Syrian children are out of school. For many aid organizations, education is of secondary importance to providing other services to refugees. Similarly, Dhingra asserted that governments and NGOs are reluctant to acknowledge that the refugee crisis is not likely to end any time soon, and that more long-term solutions need to be put in place. Dhingra highlighted the long term effects of the education crisis. “When you compound the price of keeping kids out of school for years and years, the loss will get even greater,” Dhingra said. Dhingra also focused on the barriers to refugee education in Jordan, highlighting access, affordability, safety, and discrimination as the largest barriers to young Syrian refugees’ education. Following Dhingra, Political Science Professor Malekzadeh gave a presentation titled, “Can we be Latvian and Global Citizens, and if so, is One Contingent Upon the Other?” In Malekzadeh’s lecture, he focused on the power of a place in forming who we are and who we can be. Malekzadeh questioned the boundaries of being in a place and having a particular identity, suggesting that there need to be boundaries and limits to who can enter a community. In his presentation, he gave a European point of view to the crisis, suggesting that Europeans feel a loss of identity when there are no limits to who can join their communities. The final presentation was given by Dobbs, Professor of Political Science, and was titled, “The Domestic Politics of International Crisis Response.” In her lecture, Dobbs focused on the countries in the European Union’s domestic policies and how these policies react to refugees. Dobbs focused on three questions: are there international laws to guide asylum policies, hasn’t Europe learned anything in the past sixty years, and why is there so much variation of response to refugees within the EU. Dobbs focused on the diversity of economies, employment statistics and internal political opinions within the EU, as well as EU-wide policies regarding immigration to highlight the different responses of different member nations of the EU. 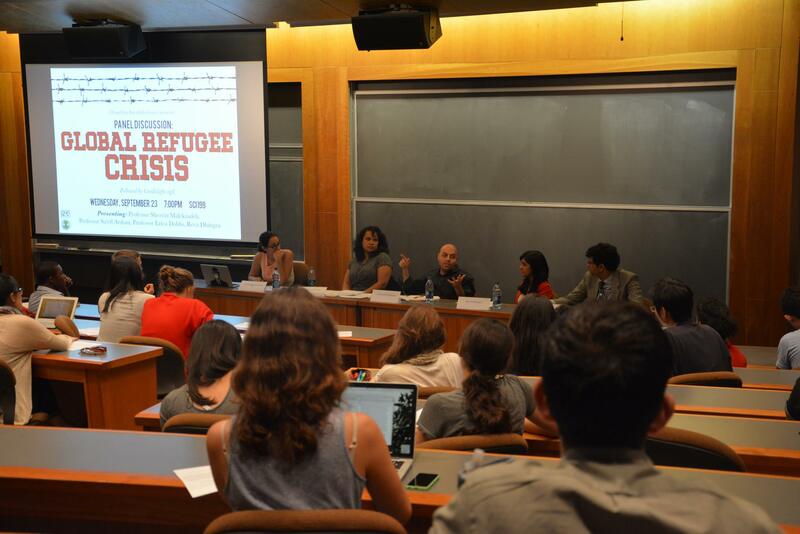 Following the presentations, students, faculty and staff members asked questions of the panelists, on topics ranging from the future of the Syrian crisis, to the implications of the Global Refugee Crisis on the Swarthmore campus. After the question and answer portion, the panelists and audience members participated in a candlelight vigil and a moment of silence to recognize the growing crisis.